Located on S Fort Hood St just north of W Stan Schlueter Loop, Extra Space Storage serves residents of Killeen. Locals will recognize our facility near HEB a few minutes north of Reeces Creek Elementary School. For active military, military families, and base personnel at Fort Hood, Extra Space Storage is a convenient option for secure storage units and vehicle storage. Our facility is about 4.8 miles from base. Do you need a storage unit close to the airport? Our S Fort Hood St location is about 6.5 miles from Killeen-Fort Hood Regional Airport, so we're a great solution for Killeen and Fort Hood residents and visitors. 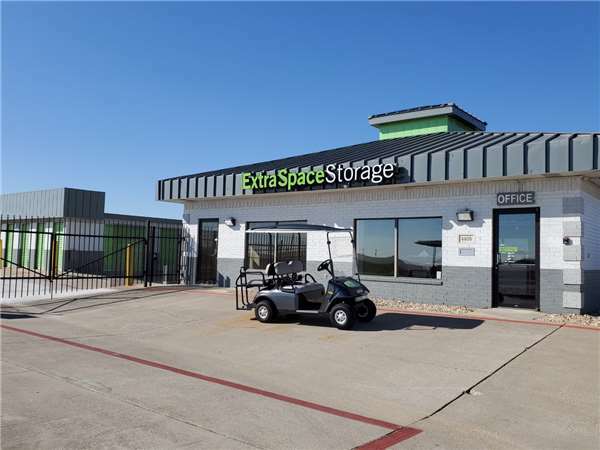 With a variety of storage units, climate-controlled storage, vehicle storage, and exceptional security, Extra Space Storage on S Fort Hood St can accommodate residential and commercial storage needs in Killeen! No matter what you need to store, our Killeen storage facility has the perfect storage space for you! We have everything from small 3x5 storage lockers to large 12x40 drive-up units. To provide a safe environment and peace of mind for our customers, our S Fort Hood St location has security features like 24-hour video surveillance and electronic gate access. With climate control, your storage unit stays at temperatures between 55 and 80° year-round, protecting your items from Killeen's extreme heat, humidity, and cold. Climate-controlled units are available in sizes 3x5 to 10x35. Extra Space Storage in Killeen has the secure vehicle storage options you want. With 10x10 to 12x40 enclosed drive-up units and 10x20 outdoor parking spaces, we can handle vehicles of all sizes! When you rent with Extra Space Storage, you can expect a clean, secure, well-maintained facility backed by a friendly, professional team. We go the extra mile to ensure our customers have everything they need for an excellent self storage experience. Contact us today to reserve a storage unit in Killeen! When looking for a place to store your property..i would suggest you call or check out self storage..The people are nice and willing to work with you. Extra Space storage has always been my go to storage company for years. Their units are clean, the staff is friendly and there's always availability of the type of unit that i need. Great place .. Chris is the man ! In office support is very helpful and awesome to work with. PS... bring you own lock!! I was new to storage and unaware of this - so $18 for a lock later I have learned my lesson. Just say yes to this amazing place. The staff is phenomenal! Chris’s kept me informed the entire way. And made sure I had everything I needed and the best price available . Great experience! I am very pleased with the staff as well as the level of security provided for my belongings. It's a great location and the price is affordable. This storage facility is in a great location and very clean. The employees are very kind and helpful. The cost is very reasonable. I will always recommend this storage facility. It's been smooth sailing. everything upfront. quick to answer and fix any problems. nice courteous staff. Fair prices with great discounts. storage was exceptionally clean. Very clean and clearly the price is very affordable, I checked other storage facilities in the area and Extra Space had the best price without a doubt. I will very happily tell as many people as I can , if you're looking for a nice clean and comfortable place to store your belongings go to Extra Space Storage. The sales associate Carlos was the best. He showed me around the storage unit he ensured me that my things will be safe on their property and I believed every word he said. friendly, helpful , very clean and organized. very accessible to get to and you can go anytime you need to open your storage. Easy and pain free to get a storage unit. Extra Space Storage at made the additional storage solution for my family extremely easy in simplified intelligent courteous and helpful staff I could not have imagined a better experience or recommending another facility in Killeen or anywhere else in this country so that matter for both the price and security provided bar none and easier and more satisfying experience than I could have imagined. Amazing polite staff who understood the concerns of a fellow veteran be it that they had both served as well. Carlos and Randy were great. It was a good experience. Great customer service. Carlos was excellent! Very polite and helpful. Made me feel very comfortable in asking about any questions or concerns I had. I even came across a little problem when I returned the next day but him and his associate took care of it so fast it didn’t even feel like a problem. The grounds and the units themselves also looked extra clean and taken care of. Friendly costumer service. Very clean and have great security. We would recommend this Storage Company to everyone. Customer service was wonderful. Shane was very helpful with explaining the cost, insurance, hours and security. Great location, very clean and great customer service. You will not be disappointed. Great prices, everyone was a great help. I had never used a storage unit before. There are lots of details to work through. Shane and Carlos, the store associates, were THE BEST! They answered all my questions up front. This made the whole process pretty painless. I really appreciated their Customer Service. They are pretty hard to beat. I would HIGHLY RECOMMEND them and ExtraSpace Storage. Shane Fellers was very helpful, and honest. I appreciate his customer service, all information was given to me in a polite and courteous manner, very clean and nice facility. Amazing staff! You will definitely be well taken care of. Clean, neat and professional! Not only the facility but the staff too. Would certainly do business with them again. Good and friendly customer service staff. Helped me find the perfect size for all of my things. Drive south on S Fort Hood St. Pass I-14 and continue straight. Pass W Elms Rd and our storage facility will be on the right. Drive north on TX-195 W. Turn right onto W Elms Rd. Turn right onto Stefek Dr. Turn left onto S Fort Hood St. Our storage facility will be on the right. Drive west on E Elms Rd. Pass Ellison High School and continue straight. Turn left onto Stefek Dr. Turn left onto S Fort Hood St. Our storage facility will be on the right. Drive east on W Elms Rd. Pass Palo Alto Middle School and continue straight. Turn right onto S Fort Hood St. Our storage facility will be on the right.